Confession time. I hate leftovers. They make me a bit crazy. I’m impressed by people who can eat the identical thing for lunch that they ate the night before. But seriously? Don’t they get bored? To each their own, but when I sit down to a meal I want the food on my plate to look (and taste) differently than the last time I saw that same food. The challenge is that it makes life a whole lot easier (and usually healthier) if once or twice a week you prep and cook large batches of food for future eating. So what is a leftover snob supposed to do? For me, the answer (aside from keeping a well stocked pantry) is to prep and cook individual items rather than meals. Cut the vegetables, but don’t make the salad; cook and rinse the beans, but just store them for easy portioning; and cook the protein with just enough seasoning to keep it tender. Cook extra ingredients, not meals. That way there is always something to grab and go. Or, if you have time, lets you create something a bit more involved. Now every pantry is different, but if you were to open my fridge and cupboards at any given time you would find a variation of beans, fruit, greens, and vegetables. 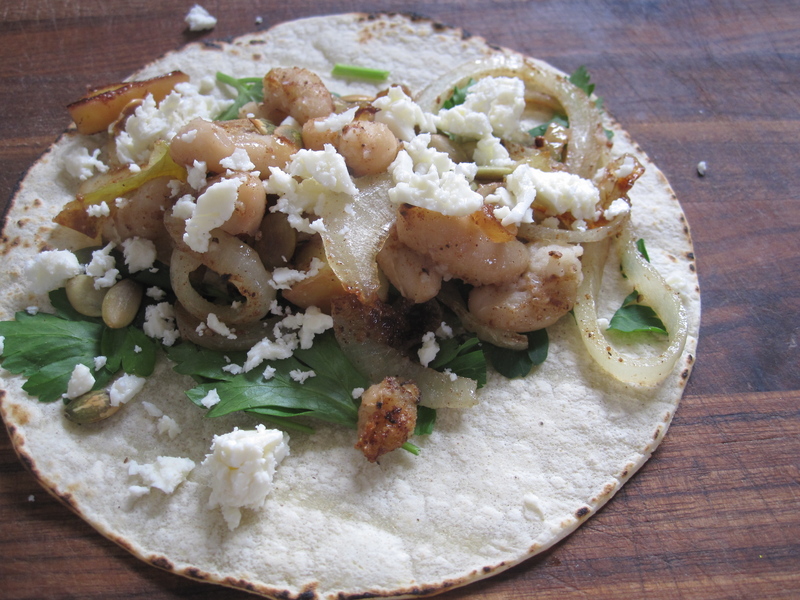 Coincidentally these are perfect ingredients for a throw together (leftover) meal of Apple & White Bean Taco’s. Now wether you want to call it a wrap, a soft taco, or eschew that portion of the menu all together I don’t really care. Lets just call it lunch shall we? For the sake of ease the recipe is written assuming that nothing has been pre-prepped or cooked. Try it once, then keep it in the back of your mind as you’re prepping for next weeks meals and you’ll never have to eat boring leftovers again. Add onion, and cook until tender, stirring frequently. While onions are cooking place apple in a bowl and toss with 5 spice powder, salt and pepper. Add garlic to pan and sauté approx. 30 seconds. Add apple mixture, cook until golden (but not mushy). Add beans or cooked chicken to pan, cook 3-5 minutes until thoroughly heated. Stir frequently. Mash beans slightly if you like. Heat tortillas according to package directions (I wrap in tinfoil and put in oven). Place greens, 1/2 cup apple-bean mixture, cheese and pumpkin seeds on each tortilla. So simple and so tasty. Even for leftovers. 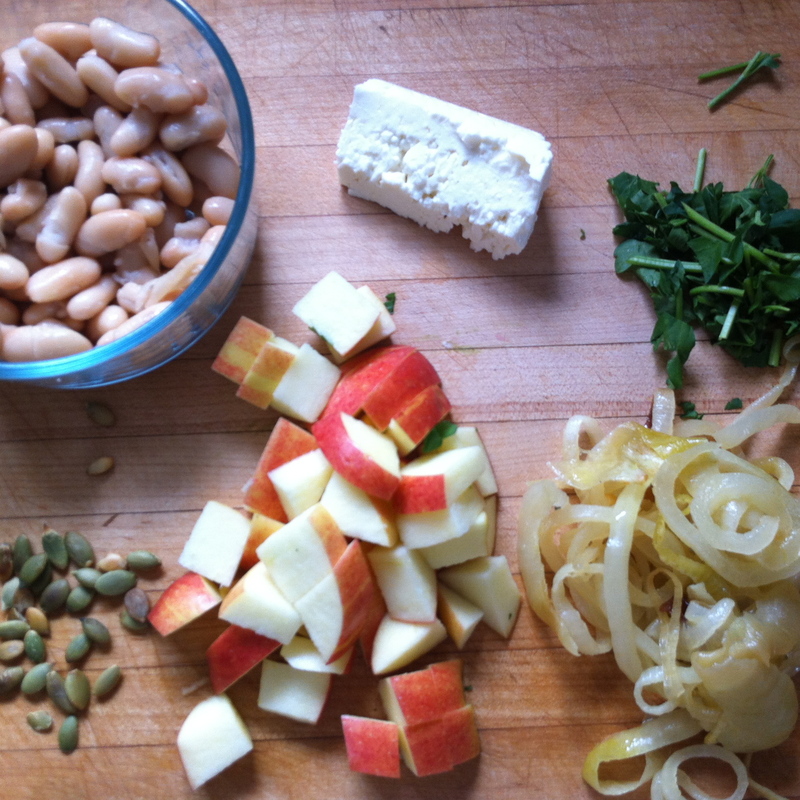 This entry was posted in Beans, Cooking, Food, Lunch, Recipe, Vegetarian and tagged apple, cannellini beans, cheese, coconut oil, feta, leftovers, onion, pumpkin seeds, spices, taco, tortilla by mostlynoodles. Bookmark the permalink. Neato I’m going to try it – thanks! That looks yum!! Hey here’s an idea-how about we swap leftovers?? Now that is a brilliant idea. When shall we start? Hey Megan! Are you going to BlogHer Food in June? Hope to see you there! Sadly won’t be able to make it to Austin… I may try and get to the IFBC in Seattle in the fall though! I think my doubting of leftovers goes back to a childhood friend. She used to take leftover KD (lets not even question why she had leftover KD) and would fry it with a boiled hot dog…. need I say more?